“But I’m scanning to PDF now…” 7 reasons why this isn’t enough – Appleby & Company, Inc. Whether in Fresno or Sacramento, everyday we seem to come across organizations who say exactly the above, “But I’m scanning to PDF already John-Paul…” They wonder what would be different with the solutions we recommend, and are curious how other clients are benefiting compared to the simple approach they’ve been taking. 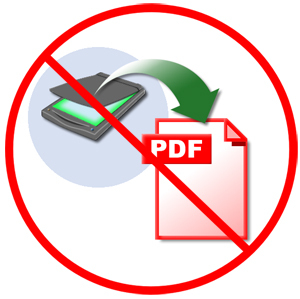 This article will explore 7 unique reasons why scanning to PDF should not be your end goal. Don’t get us wrong, it’s a great place to start but there are quite a few limitations with this approach compared to using a dedicated document or content management solution (like Laserfiche or Fortis). We will share each item below with a focus towards HR to provide context. With a simple PDF, you are limited by the name of the file in terms of providing context (what it actually is). However, with most document management systems, you have the ability to provide a template or set of metadata for a document. Here you can provide other context like “First Name”, “Last Name”, “SSN”, “Date Hired”, etc. if it’s a personnel file as an example. We recommend populating whatever fields in this template would make sense from a retrieval standpoint. In other words, you don’t want to get super detailed but it’d be helpful to have some of the most common information indexed. At this point, the documents name becomes irrelevant as we can see at a glance the Last Name, First Name, SSN, Doc Type, etc. With a PDF you are limited to a combination of characters and this cannot exceed 255 in Windows. While this might be a good approach for a single set of documents within a single department (say employee files within HR), when you branch out from here the system can collapse and you end up with a lack of standardization. New employees will come in and ask “Why did the person before me set this up this way, it makes no sense” or “How can I replicate this across XYZ documents now?”. Security with a PDF is based on basic user security whereby John Doe has access to the following set of folders on the network and he can access all documents within those folders. Generally each document is treated the same as the others (in terms of what you can do with it once inside these folders) and if a document is incorrectly placed in the wrong location, it’s now possibly able to be accessed. You could encrypt PDFs and sometimes require a password, but this is an unnecessary step that will become a nuisance after a while (both for those accessing the documents and those having to secure them). Document management solutions on the other hand provide a very granular approach to security. First and foremost, staff are required to login to the application with a username and password or they can just pass their Windows login credentials to the application if this is more convenient. This is the first step of security, and this alone dictates what type of access to documents the system will display. John Doe may be in HR and only be allowed to see the HR documents while his manager Jane Smith may be able to also see the Fiscal and Legal documents. So not only can security be at the folder level, but once inside the respective folders, staff may have limited access rights or actions they can perform. Some may only have read only access, while others may be able to scan or edit documents. Perhaps you don’t want some staff to be able to see SSNs, so you could annotate or redact this sensitive information but still have a user with the ability to “See through redactions” while a lower level user might not have this ability. In this case, they will just see white or black redactions in those locations. You can even go so far as to give people the ability to view but not print information and really maintain control over your content and how it’s accessed. Fill out our “Request Information” form to learn more about how we can help your organization today.